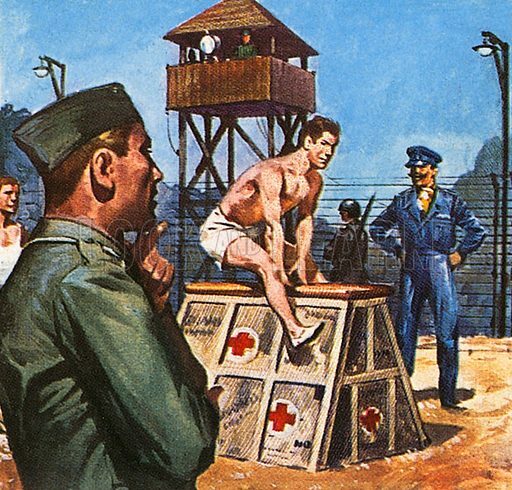 This innocent-looking scene in a prision-of-war camp in Germany conceals a great escape story. It is called the Wooden Horse escape, after an incident in ancient history. Three officers escaped by digging a tunnel under the eyes of the Germans. One of them was carried inside the vaulting horse and dug while the prisoners leapt over it. The tunnel took four months. One escaper, Eric Williams, wrote a book about the exploit. Available worldwide for immediate download up to 4,089 x 3,913 pixels.